Coming into the year there were only two boys in the individual three-mile race for 2A: senior Mathias Powell of Mahomet-Seymour and junior Adam Gilbreath-Glaub of Metamora. An early-season injury to Gilbreath-Glaub opened the door for Powell to become the clear favorite for the 2A title. Powell stayed back with the pack that featured Nathan Schmitt (Jr., Lake Forest), Anthony Farmer (Jr., Burlington Central, Charlie Smith (Jr., Antioch), and several others through the first mile, coming through in 4:47, a slower opening mile than is typical for the 2A race. 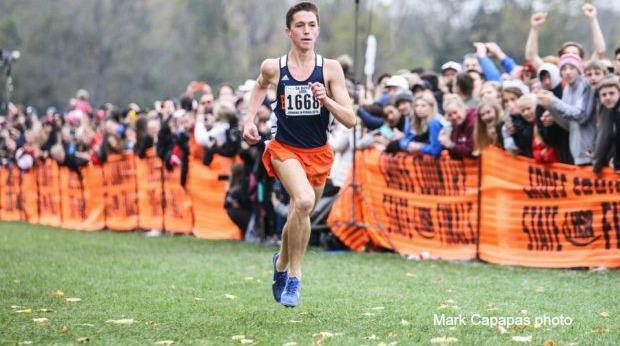 Powell may have been hoping that there would be a bandit like Brett Haffner of Hinsdale South last year that led the race through a mile and a half, but this wasn't the case. That left Powell to do the work and he embraced it. Throwing in a surge as he entered the triangle, he managed to put a good seven seconds on the pack in the back loop. Powell came through two miles at 9:38- 15 seconds ahead of the now chasing Schmitt. It was clear with less than a quarter-mile to go that Powell was going to pick up his first title. He maintained the consistent neutral form that put him in the driver's seat finishing with a 14:31, which is the 13th fastest time by a 2A runner since the classes split into three. He won in dominant fashion to claim his first state title, as Schmitt was a whole 16 seconds back in 14:47. Three other runners broke the 15:00 barrier: Farmer 14:53, Smith 14:54, and junior Nick Doud of Bloomington who closed hard to run 14:59. This was the culmination of a superb season by Powell. Now, all eyes will be on Powell and how he performs at the Nike Cross Regionals this upcoming weekend, especially after the breakout performance he had there last year. The team battle was a close one, but the outcome was unsurprising as top-ranked Chatham-Glenwood clinched it for their first team title with an eight-point win over Central States 8 Conference rival #2 Springfield. #3 Bloomington rounded out the team trophy winners in third with a total of 167 points. The Titans ended up placing 7th, 14th, 32nd, 58th, 112th, 122nd, and 174th. The most shocking part about this team battle was that only 15 points separated first place finisher Titans and fourth place finisher #6 Maple Park (Kaneland). There were major upsets here as well, including #9 Sycamore taking 6th and unranked Danville taking 8th. This was likely the best team race in a long time in 2A as Mahomet-Seymour had been so dominant in previous years.